Call us crazy. Maybe we are. Busy with other client work we envisioned and created an event that would benefit one lucky company, charge us up, kick up our creativity, and keep us up all night. On March 10th we had our Marketing Intervention, complete with live streaming (no sound) and chat. If you missed it (maybe you’re not a late night person?) you missed a lot and not much at the same time. We had plenty of toys to keep us from burning out and you’d have wanted to tune in for the target practice with the surprisingly accurate potato gun or you would have seen mostly brainstorm discussions and reading (an unglamorous peek behind the curtain) and, um, eating…the food and caffeine flowed aplenty. We love marketing and actually like doing the hard stuff. 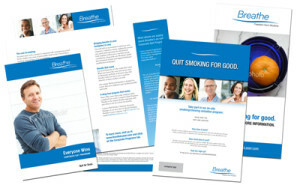 We had fun helping another company with a marketing deficit develop tangible marketing pieces and kick up their brand. But also, after a stressful couple of years we got to pull out the stops for a very positive reason. And, it showed us just how much can be accomplished with focus, concentrated resources and collaboration (with a bit of play in between). Thanks go out to all of our great designers, copy writers, our art director, account directors and others who contributed to this active 24 hours of creation. And thanks to Rick Diamond of for his patience and participation. Rick was on call for the entire event. He was game – didn’t faze him a bit because he’s not a big sleeper. But he does want to help more people quit smoking through his company Breathe: Freedom from Nicotine (formerly Breathe Laser Therapy). He answered tough questions for us and hung in there through the seemingly amorphous process. Here are some of the marketing deliverables we created. We also developed a document of recommendations for Rick’s business that we can’t show you. It was harder and easier than we thought it would be. The excitement fueled a great thought process and creativity. Designers bore the brunt of the stress to come up with their best work in a shortened timeline – plus it was on their shoulders in the wee hours of the morning, along with the website and SEO recommendations. It confirmed that our creation process is a good one and it’s even more important to adhere to a prescribed flow when there’s no time. All in all it was an exhilarating and exhausting process. It confirmed the old cliché – when you work together, you can accomplish plenty and have some fun along the way. We’d definitely do it again. Oh, and no art or account directors were harmed in the making of this Intervention. What’ve you done lately? What do you think about the Marketing Intervention? Tell us here or at our Facebook page.